Recently, I have seen an increase in requests for second peg holes (mekugi-ana). Although one would think that two pegs would be better than one, at best, a second peg has no effect, and, at worst it can jeopardize the structural integrity of the tsuka and shorten the handle's life span. During a study session, Takahiro Ichinose explained that on most long swords the mekugi-ana is around "3 finger widths" from the tsuba, which is the pivot point, or point of least stress during most cuts. 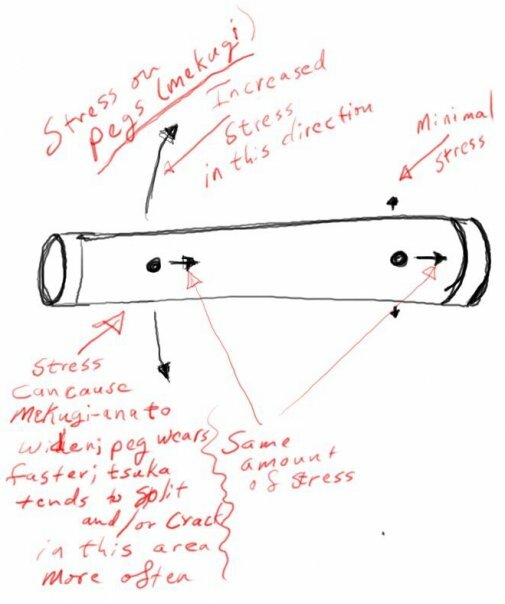 The further away from the pivot point a peg hole is, the greater the strain on the peg (mekugi). It has only been in the last 10 yeas that I have seena lot of "Japanese" (but not really) swords with two pegs. All of them are modern reproductions like from Cheness and Bugei, or those coming out of China and Pakistan. Does this make sense to anyone aside from me? Why -or- Why not? Within the last year or two I have seen a growing trend in requests for reverse placement of the menuki to "improve the grip." While studying in Japan, I was told that the placement of Menuki is meant to be as much for the grip of the sword as hubcaps are meant to affect a car's traction. Takehashi-sama always maintained that, traditionally, menuki are meant to be ornamental and symbolic. Regardless of the style of mounts or maki, the menuki on the omote side (the side that faces out) is in motion toward, in concert with, and closest to the fuchi & tsuba. The menuki on the ura side (the side facing in) is closer to the kashira is simply to make it more visible. The most common seeming "contraction" to this rule is found on transitional swords, or swords in handachi mounts, that were meant to be worn as either tachi or katana. These were designed to be carried daily on the street, as well as in battle with armor. If anyone has any information on, or an example of a true Japanese sword style that varies from this rule, I would love to see it. For me, one of the most enjoyable aspects of working on Japanese swords is how each tsuka or saya that I receive is a new learning experience.